This accompanies one of a series of workshops given at Vancouver's Brock House. Part 1 looked at Windows 10 - it's history and its user interface: Start Menu, Taskbar, Desktop, the many ways to start programs and Settings. This part will look how to make Windows 10 work for you, customizing its set up and settings and improving privacy and security. We'll start in the Settings - the replacement for the Control Panel used in older Windows versions. There are multiple ways to open Settings - listed in Part 1. One way is to click on the Start Button (in the lower-left corner of the screen at the end of the Taskbar), then look for a gear icon near the lower-left of the Start Menu. (Wherever you see that gear icon, you can open Settings. However you open it, you should see a window with icons - each one opens a different section of settings. We're going exploring! Note that there are 'Quick Action' icons for many of these settings - a faster way to (for instance) turn Airplane Mode on or off. Click on the icon on the far right-hand end of the Taskbar for the Notification & Action Center. (More on these in Part 1). Each icon has a title and a list of some of its sub-sections. There's also a search bar in the top-right corner, allowing you to search for something that you want to customize. Note that your list of items may differe depending on what version of Windows 10 you're running. To see all these items, you may need to scroll down the Settings window. We are not going to look at all these items! Note that items may move around with different Windows 10 versions. The 'Apps' section is new with the Fall 2017 version, for instance - everything here was formerly in the System section. We're going to start with Personalization - note that in many of these items you'll need to scroll down to see all the options. When you open a section, there will be a Back button and a Home/gear icon in the top left to return. No need to click an OK button - as soon as you change something it the change is applied. Colors to choose a custom accent color or to 'automatically choose a color from my background'. Colours can be applied to the Taskbar and Start Menu and to the 'title bars' at the top of active windows. Start customizes the appearance of the Start Menu. We'll come back to the Start Menu later. Taskbar customizes the appearance of the Taskbar, locking it in position, turning 'hiding' on or off. 'Badges' are little numbers on Taskbar icons - for instance, showing the number of unread email messages. Power & Sleep lets you set how long before your computer screen blanks out and how long before your computer puts itself to 'sleep'. Storage shows how much free space is on your internal drive(s) and offers an option to let Windows automatically delete temporary files to free up space. Accounts offers information and settings about your log-in accounts. Do you have multiple accounts for multiple users or one account for everyone? Do you use a 'local account' or a cloud-based 'Microsoft account'? Family & other people lets you add additional users to your computer - each one gets their own log-in and separate, private desktop, documents, and other personal storage. You can give kids access with limitations. Privacy lets you make decisions about what information to share with Microsoft. Explore this area and decide for yourself what you feel comfortable sharing. Update & securitylets you check for updates, set how/when updates are installed and more, lets you work with backups and restore your computer if it isn't working well. Windows 10 includes Windows Defender Antivirus - which may provide enough basic protection and allow you to remove the trial antivirus software that came with your new computer. Ease of Access - take a look here if you find it difficult to see or hear your computer, or to use the keyboard or mouse. There are settings that try to help with these sorts of issues. Spend some time poking around the various Settings options - see which you want to change or adjust. The Taskbar is the long, narrow strip that by default sits at the bottom of your screen. We discussed the various items on the Taskbar in Part 1. This time, we're going to look at how you can customize its appearance and behaviour. We've already noted that you can customize various settings using the Taskbar item in the Personalization section of Settings. You can quickly get to the same place by right-clicking on the Taskbar. From the popup menu, left-click on the last item - Taskbar settings. Here, you can choose whether or not to lock the Taskbar or allow it to be moved to a different edge of the screen. You can set it to automatically hide when not in use to gain extra screen space - or turn off that behaviour if you find it annoying, and more. The Cortana item in the popmenu offers settings to the Taskbar's search box: you can show or hide it or show only a round Cortana icon. The Taskbar displays a set of small, coloured program icons - this is a handy way to start up programs that you use often.... you may want to add frequently-used program icons to this area. But space is limited - you don't want this area cluttered with icons for programs that you don't actually use often! Lets start by removing the icons you don't actually use. Have no fear doing this - you are not uninstalling these programs, and you can add their icons back to the Taskbar if you change your mind. To remove a program icon from this section of the Taskbar right-click on its icon. A menu will pop up. Click on Unpin from Taskbar. Done! To add a program's icon to the Taskbar, start by opening the Start Menu - I want to add an icon for Word 2016, so I need to scroll down the alphabetical programs list and find Word 2016. Right-click on the icon - a menu will pop up including the option More >. Click on that, and you'll see Pin to Taskbar. That will put the icon on the end of the set of program icons. If you want it to be somewhere else in the set, point your mouse pointer to it, hold down the left mouse button and drag it to your preferred position. quick access to the Settings app, and for shutting down/restarting the computer. Beside that, there's an alphabetical list of programs. And on the right, there is a set of square and rectangular tiles, arranged in groups. 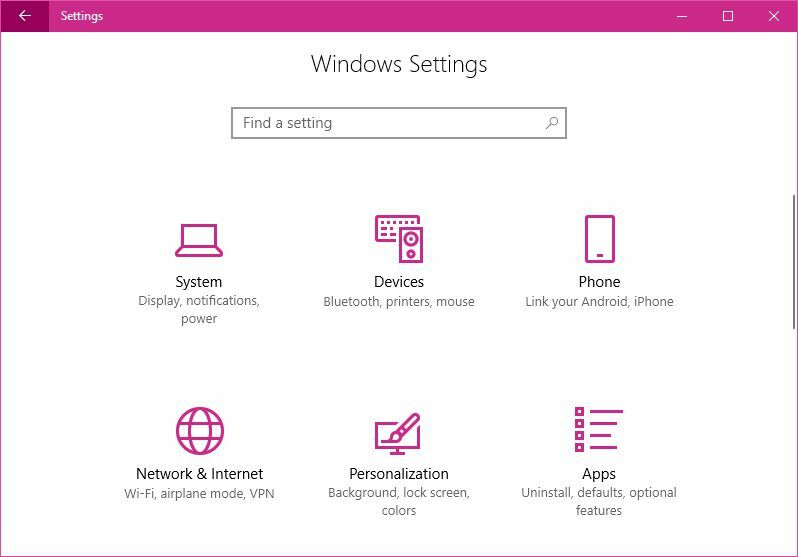 We already saw that there are settings for the Start Menu in the Settings app's Personalization section, discussed above. These let you choose to see more or fewer tiles, show the alphabetical app list, show recently added or most-used apps or 'suggestions' (at the top of the alphabetical list), or show the Start Menu full-screen (as was done in Windows 8). There's not much you can customize about the icons on the left - if you click the three horizontal line icon at the very top of that column, the column will get wider, adding labels to the icons - but it will cover up the alphabetical programs list. Not a good trade-off in my opinion! Click the icon again to restore it to the narrow icon-only view. If you right-click an icon in the alphabetical list, you'll get a pop-up menu with some useful items. You can choose to Pin to Start - adding a tile for that icon to the tiled section on the right side of the Start Menu. You can also Uninstall most (but not all) programs - that will remove the program from your computer, so be sure that's what you want to do! (Note that you can also uninstall programs from the Settings app's Apps section. If you click More in the icons pop-up menu, you'll see the option to Pin to Taskbar discussed above. You can do a lot to customize the display of the tiles - you can drag a tile to another location, for instance. Right-clicking on a tile gives you a number of options in a pop-up menu - Unpin from Start removes the tile from this section, but doesn't uninstall the program. A program icon remains in the alphabetical list, giving you the ability to replace it in the tiles if you desire. Resize lets you change the tile's size: options are small, medium, large, and wide. More lets you choose to turn Live Tile on or off. A 'live tile' displays changing content - news or weather reports, for instance. Or sample photos from your folders. Not all icons support live tiles. You can pin or remove a program icon from the Taskbar from here. You can change the names of the various labels: Create, Play, Explore, etc... if you hover your mouse over a label you'll see two horizontal lines appear to the right of the label. Click the lines and you can edit the label's name. Security deserves a workshop all on its own! Windows 10 includes the best version ever of Microsoft's built-in free security program - Windows Defender. It may be all you need to use. See: 4 Reasons to Use Windows Defender in Windows 10. Many new PCs come with a security program already installed - but typically it's the trial version of a commercial package and expires after as little as 30 days. There are a number of good free security programs (most free versions will nag you to buy their paid package). 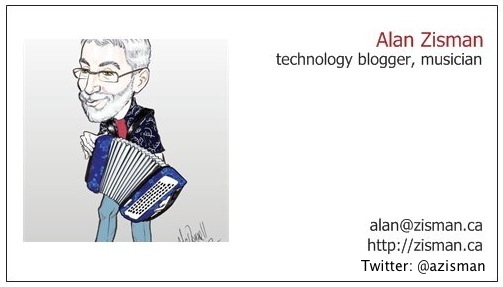 PC Magazine each year reviews free and paid security packages. For 2016, the free programs they recommend are: Avast Free Antivirus 2016, AVG Antivirus Free and Panda Free Antivirus. Any of these are worth downloading and installing - however, I find the constant requests to upgrade to the full (paid) version annoying in these programs. For me, the built-in Windows Defender seems to work fine - with the addition of the free version of Malwarebytes letting me scan my system if anything seems a bit off. No security package provides complete protection, however. Users should allow Windows, Flash, other programs and apps, and your security software to upgrade itself - don't put this off! As well, it is important to remain vigilant - don't click on links in email from strangers or open unexpected file attachments. If a deal looks too good to be true, it's probably malware. Remember that your bank will never email you asking you to log in and that Microsoft/Windows will not phone you to tell your computer is infected. If a message pops up in a web page or on your screen warning that you have been infected - unless it is from the security software that you installed - it is bogus! For your own protection, it is very important to regularly back up your computer. Windows 10 includes backup software (See the Update & security settings) - but it's up to you to purchase an external drive for backup and to use it regularly. More information... The three easiest ways to back up your files and If we show you how to back up your PC for free, will you finally do it? 'Apps' is short for applications (also called programs) - every computer (including smartphones and tablets) runs applications designed for that computer's operating system - the nickname 'apps' became common when Apple opened its 'App Store' for its iPhone in 2008. But really, feel free to use the words 'programs', 'applications' and 'apps' interchangeably. Windows 10 mostly refers to programs as 'apps'. Microsoft Solitaire Collection - Solitaire's back on Windows! Yes! Traditional Windows Accessories - Windows 10 also includes a set of traditional Windows accessories, located in a Windows Accessories folder in the All Programs list. Among them: Character Map, Internet Explorer, Notepad, Paint and WordPad. Your new computer may include trial versions of applications - this is especially common practice with security applications and Microsoft Office. These trial versions typically stop working after a short period of time in the hope that you will then buy the application. You don't need to do this! You're less and less likely to be able to purchase software on a disc that you then install on your computer - more often you'll get what looks like a credit card with a download link and a serial number. 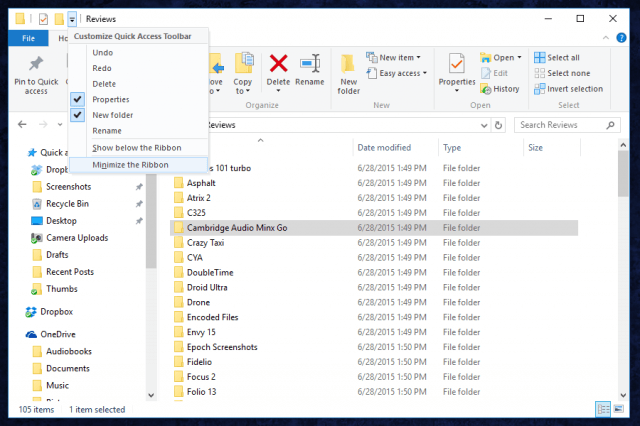 Like earlier Windows versions, Win 10 includes the Windows File Explorer utility for basic file management - listing files and folders on your computer's internal hard drive, deleting, copying, moving, renaming, opening them and more. Its icon can be found on the Taskbar - where it looks like a yellow file folder - and in the folder of the All Programs list (where there are two copies, one named Windows SystemFile Explorer, the other This PC). Note that (as was true in older Windows versions) you can change the view, letting you look at files and folders as large icons, medium or small icons, lists with details, and more. If you use the Detail view, clicking on the category names (Name/Date modified/Type/Size) lets you sort by that detail - it can be useful to arrange the list with all the photos together in a group followed by all the Word documents, for instance. Click on the category name again and the list is sorted in reverse order. Again, like in older versions, there are some handy tricks for selecting multiple items - click on one, then hold the Control key down while clicking on additional items. Everything selected can then be copied or deleted or whatever all at once. Click on a first item, then shift-click further down - and everything from the first to the last item is selected. Control+'A' selects 'all' items. There are multiple ways to copy or move files - you can drag selected items to a folder shown on the left. Or open multiple File Explorer windows and move items from one to the other. Or right-click on a selected item (or items) and choose Copy or Cut (to move) from the pop-up menu then open the desired destination, right-click and choose Paste. This is especially handy as it overcomes what is otherwise a potential source of confusion - in Windows, if you try to copy from one location to another, if the source and destination are on the same drive, by default the items are moved - not copied. If the destination is on a different drive from the source (for instance, your computer's hard drive and a flash drive), the items are copied - not moved. Links - lots more you can follow up on!